The jewelry I present to you today, were created in relation to a personal experience I had few weeks ago. I was invited by an old time friend to come to a meeting. In the meeting I met few other old time friends whom I haven’t seen in years. We started talking and discussing some esoteric issues. During the conversation, I found that they held some beliefs and perceptions which through my studies over the years, I have found them to be untrue. When I tried to present my point of view, I was encountered with wall of hostility. The fear of coping with different views and perceptions scared them and arouse anger and hostility. I believe we need to constantly examine our set of beliefs and be ready to face the inner dignity and inner truth which can take us further to a better place. This story of facing the truth leads me to the next models. The first two were created in collaboration with no other than my brother - Jonathan, who is a designer and an amazing master engraver. 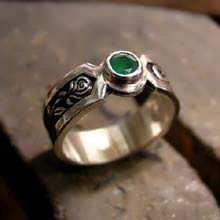 The idea for the Philosopher’s ring was brought up by him and immediately I knew it was an answer to my experience described above. It is a ring of dealing with your inner truth in a hostile environment. 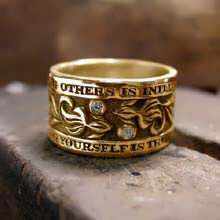 The “I” wisdom ring was created in relation to the book of Tao and the sentence engraved on it also speaks about knowing yourself. The third ring is the Vesica Pisces ring which is a symbol of light, creation and balance. "The Philosopher's Ring". 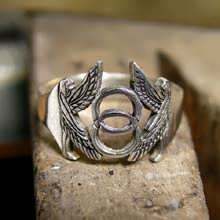 It is a modern take on the 17th century philosopher Baruch Spinoza's own signet ring. 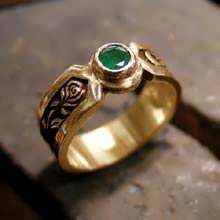 The Known philosopher Baruch Spinoza wore a ring, one on which he personally engraved a rose and the latin word - Caute (watch out). The rose symbolized himself since the name Spinoza is a variation of the the Spanish word for thorn. Spinoza was well aware that he was considered a thorn among the Jewish community in Amsterdam. His ideas irritated the Christian authorities and the Jewish community was afraid that anger will be pointed to them. So the jewish community banished him (although his ideas appeared centuries before him by kabbalistic figures). Einstein said: "I believe in Spinoza's God, who reveals himself in the harmony of all that exists, not in a God who concerns himself with the fate and the doings of mankind." 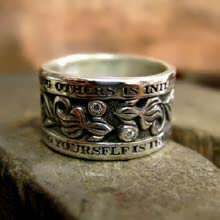 The “I” wisdom ring is based on my favorite life changing book and one of the best books ever written - the book of Tao, attributed to the Chinese philosopher Lao Tse. The Taoism is a philosophy based upon the understanding of the laws of the universe - the Yin and Yang. The balancing powers, existence and nothingness, the female and male. Taoism explains the effortless way of action called - Wu Wei. This sentence comes to emphasize that by knowing our true selves we can understand the Tao and how it works - that is true wisdom. The structure in the ring is known as the Vesica Pisces or the first day of creation. It is a symbol of the infinite consciousness which is in all of us, learning and experiencing itself through creation. This simple structure consists of two crossed circles, by which one can extract many geometrical and mathematical laws that represent our reality. It is an ancient symbol of knowledge, wisdom and love. The two winged images are called the Cherubim and represent the male and female and the perfect balance between the two forces composing reality. 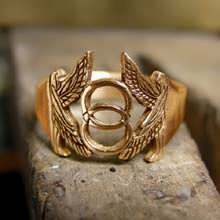 The Cherubim were found upon sacred artifacts in ancient Egypt. Last but not least - Five new Leo talismans were assembled yesterday. 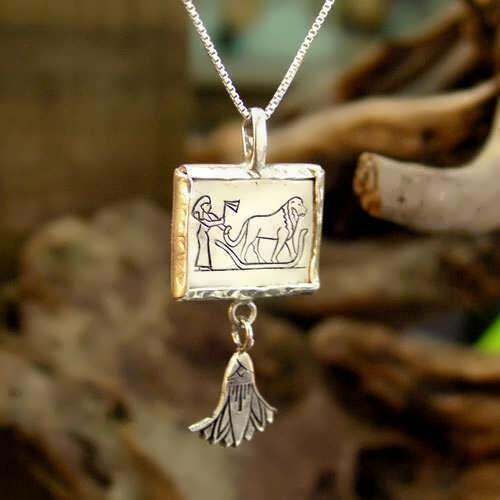 The Leo pendant is a genuine "Leo talisman". The Talismans were assembled on the 24th of July between 5:51 and 6:40 which is the time of the greatest Sun influence on Leo. It is a known astrological principle that we aspire to embody fully the energy of the Sun as the Sun is the generator of the life force, of great inner power. It is a way to tap into our most basic force of being. When we stand at the center of our 'life' (Sun) everything starts orbiting around us in clarity, all our planets (different life expressions) act in a harmonious way. When we say - I am an Aries/I am Leo etc… we mean that in the time we were born the Sun was in that zodiac sign. The bottom of the pendant contains the Lotus Flower which closes in the night and opens to the sun during the day. It is a symbol of accepting the power of the Sun. The talisman contains a piece of pure gold inside which is the metal that represents the Leo sign.